Grandma just a few days ago. Shushing me. There’s still a vital soul in there, despite the physical infirmity. 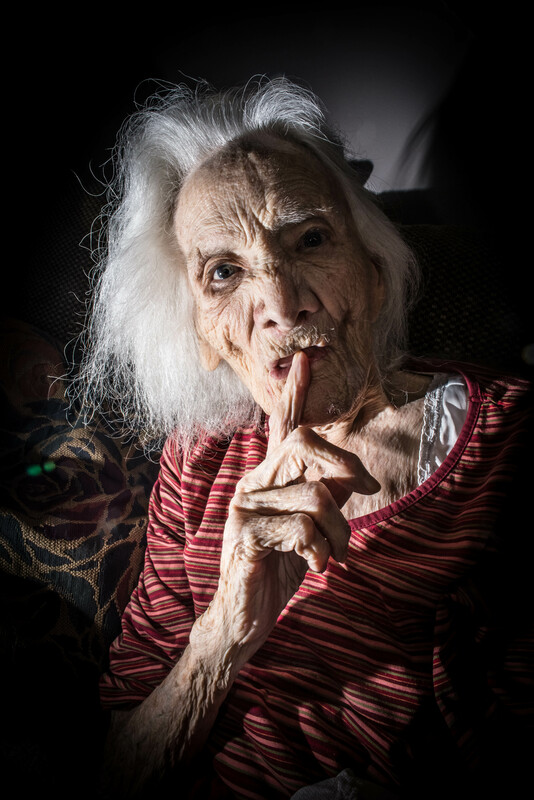 This entry was posted in Aging, Caregiving and tagged 101, aged, ancient, behavior, care, caregiver, caring, death, emotional, emotional toll, exhaustion, family, grandma, grandmonster, grandmother, independent, life, senior, sense of humor, sweet old on October 10, 2013 by Rob Jones. I just feel so much love every time I read your posts. It’s such a great affirmation of life and real tribute to the beauty of being human. Thank you for sharing that lovely, honest, conversation – I’ve been checking in now and then, hoping that you and your Grandma are doing okay. I’m so sorry that she’s getting so weak, and so happy for her that she’s in your loving home with you. Trying to type through tears is not that easy but I had to say that this is possibly one of the most beautiful things I have heard/read in ages. Rob, you have so many people “with you” and thank you for sharing!!!!!!! What an amazing man you are! Possibly the most honest conversation I’ve had an opportunity to eavesdrop on in years. So much love in so few words. And of course, now I’m crying. Thought of you just the other day. Safe journey to Grandma. Grandma knows and appreciates. What greater gift is there? Blessings to you both as you walk these final days together. Have faith and trust – Grandma is right. That’s so sweet, Rob. How amazing that you 2 can talk about that. She looks so incredibly beautiful and ancient. You’ll make it, Rob, in your new home; and so will Grandma to her new home. I don’t know if you feel stronger for it, but those you don’t know out here are with you and Grandma in spirit. You are doing a really good job, Rob. It’s remarkable what you’ve taken on and so admirable. I can’t even imagine the struggles you’ve been going through these last weeks. I’ve followed your stories about life with your grandma but have rarely (if ever) commented before. Your love for her is so easy to see in your words and photos and you’ve shared that love with us, your readers. Much love to you and Grandma. Thanks so much, Susan. I appreciate it…and though I don’t comment on your stuff much…I very much keep up with your travels and life through facebook…I’m so glad that you’re one of the flickr friends from afar that I actually got to meet, even if it was brief!